We recently put together a package of my husband Blair's five bestselling books, plus guardian angel and love never dies wristband and they proved to be very popular. 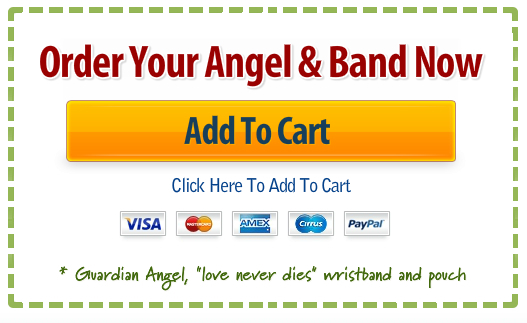 Many asked if they could get our Guardian Angels and “Love Never Dies” wristband separately. Our graceful Guardian Angels are taken to the strongest vortex in Sedona, Arizona – Bell Rock – where they are blessed and energized. These Angels symbolize protection, hope, comfort and aspirations. A perfect gift for you or someone you love. Blair has personally prayed and asked spirit to protect and bless those that carry these guardian angels. **Silver tone zinc metal alloy – 1 ¾” tall / 42mm approx. Blair’s mantra has always been “LOVE NEVER DIES.” It’s a message that he believes he is called to deliver. Purple is Blair’s favorite color, as it was the color that glowed when he saw his grandmother in a vision… the same one who proved that while she had transitioned, her love had never died. 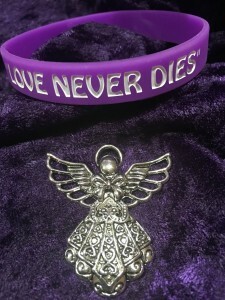 We have created a purple wristband with “LOVE NEVER DIES” for you to wear as a reminder. Wear our “Love Never Dies” wristband to remind you and others your deceased loved one are always near and brings comfort to your heart and peace of mind to your soul. 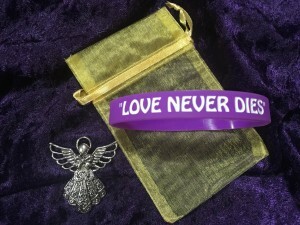 **Purple, silicone, custom designed, engraved and color filled with Blair’s “Love Never Dies” motto.